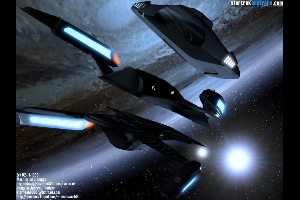 In Multi-vector assault mode The systems are as follows: Saucer Section: Speed Cruising Velocity: Warp 6 Maximum Velocity: Warp 7 Emergency Velocity: Warp 8 (for 8 hours) Phasers Type X Array: 5 Type XII Array: 2 Torpedoes Pulse-Fire Torpedo Launcher: 2 Photon Torpedoes: 70 Quantum Torpedoes: 50 Tri-Cobalt Devices: 2 Mid Section: Phasers Type X Array: 4 Type XII Array: 2 Torpedoes Pulse-Fire Torpedo Launcher: 2 Photon Torpedoes: 70 Quantum Torpedoes: 50 Tri-Cobalt Devices: 2 Lower Section: Phasers Type X Array: 5 Type XII Array: 2 Torpedoes Pulse-Fire Torpedo Launcher: 2 Photon Torpedoes: 70 Quantum Torpedoes: 50 Tri-Cobalt Devices: 2 The Prometheus-class was a Federation starship designed for deep-space tactical assignments. It was one of the most advanced Starfleet vessels in operation during the latter half of the 24th century. Page Rendered in: 0.035 seconds.